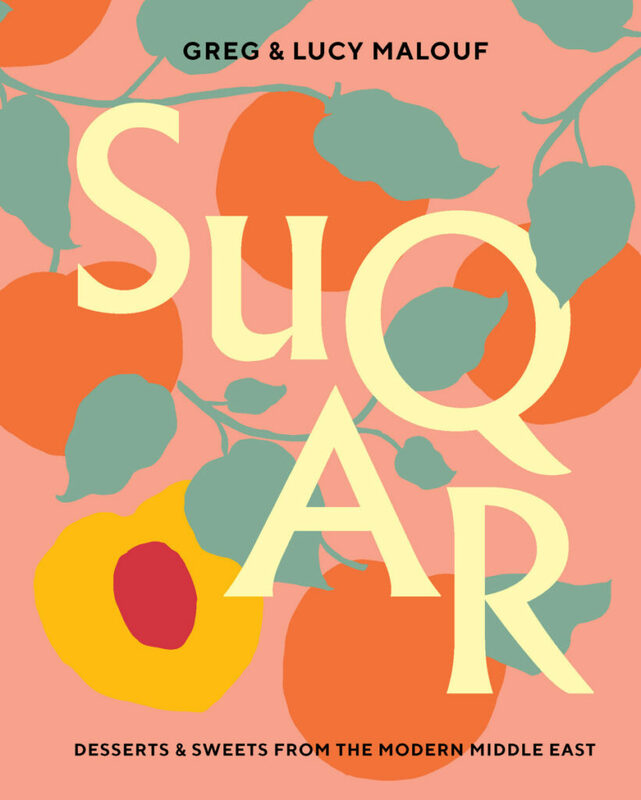 I was primed to love “Suqar” by Greg and Lucy Malouf, their eighth collaboration. I am as susceptible as other food lovers these days to the flavors of the Middle East. The old reliables sometimes just feel old. The recipes from the Malouf duo – he of Lebanese descent, she of Australian – speak to me with a kind of multicultural sparkle. Chocolate ice cream – yawn. But Chocolate-Halva Ice Cream? Sold! Tarte tatin. Ho-hum. But Spiced Plum Tarte Tatin with bay leaf, pink peppercorns and star anise. Wow! Lemonade. Same old, same old. But Iftar Jallab, “an immensely popular molasses drink from the Middle East?” Merely the ingredients list – jallab syrup, rosewater, pinenuts and golden raisins – is transporting. As are the photos in “Suqar” (the Arabic word for sugar, by the way, and the origin of our English word, the Maloufs relate) – page after page of gorgeously styled desserts strewn with pistachios, candied rose petals, candied oranges, sesame seeds … Credit where credit is due: Alan Benson took the pictures. It’s a big book, with a wide range of recipes in chapters on fruit, dairy, frozen, cookies, fritters and pancakes, preserves, drinks and more. “Suqar: Desserts & Sweets From the Modern Middle East” by Greg and Lucy Malouf. Hardie Grant Books. $40. But the proof is in the pudding, quite literally when it comes to a baking book. And so far, I am sad to report, I have had less luck there. Other tests didn’t go quite as planned. The Dates in Cardamom Coffee were five minutes’ work, basically soak medjool dates in slightly sweetened espresso flavored with cardamom and cinnamon. I liked the flavor, I liked the little pick-me-up in early afternoon when I am always snoozy, but the dates became waterlogged, or rather coffee-logged, and their normally luscious, meaty texture decamped. Perhaps had I gone on to use them to make the inventive Date Tiramisu, Middle Eastern Style, which also called for orange blossom water and pistachios, the slightly mucky texture wouldn’t have mattered. It didn’t when I chopped up the dates and stirred them into yogurt – with buttered toast, it made for a satisfying breakfast. I had texture problems with the Bitter Walnut Cake, too, but it may have been user error. Were my ground walnuts too wet? (I wish the recipe had instructed me to grind them with a little sugar, which can guard against walnut paste.) Did the whole-wheat bread crumbs mess things up? (The store had mislabeled the bread I grabbed as white.) Careful as I was, did I deflate the whites when I folded them into the batter? Or did I get the temperature wrong? The recipe instructions in “Suqar” are mostly clear and careful, but I found the oven temperatures throughout confusing. Here, for example, is the baking temperature for Bitter Walnut Cake exactly as written: “140 C (275 F) fan-forced 160 C (320 F).” Fan-forced, I am reasonably certain, is the Britishism for convection oven. Usually, recipes call for lower convection oven temperatures because they run hot. Without some punctuation to guide me, though, which setting I should chose – 275 F or 320 F – was muddy. I don’t own a convection oven; I guessed and went with the higher setting. All this said, the flavors of toasted walnut, orange zest, cardamom, and cocoa in the Bitter Walnut Cake were unexpected and in perfect harmony. I thought I’d settle things once and for all with the Pistachio Friands with Summer Berries. This time, the texture was perfect – moist, dense (in a good way) and springy. And the little cakes were adorable, too. The flavor, though, underwhelmed me. I’d like to try making them again, but next time I’d increase the salt (the recipe calls for a pinch), add lemon zest and perhaps a little almond extract, too. There’s the rub. Do I try again? So very many recipes in these pages appeal to me. But baking takes time and money, and when you are done, there are a lot of dishes to do. It’s disheartening when the results disappoint. Wait. Here’s an idea. I’m going to crowd-source a test. You make the Bitter Walnut Cake, please, and report back. Preheat the oven to 350 degrees F. Grease a 9-inch springform pan or cake tin and line the base of the tin with baking paper. Spread the walnuts and bread slices out on a baking tray, keeping them separate, and toast for 8-10 minutes, or until the bread is dry and the nuts are darkening. Remove from the oven and lower the oven temperature to 320 degrees F.
Cool the nuts and the toasted bread completely, then blitz them separately in a food processor until evenly and finely ground. Take particular care with the walnuts; it is all too easy to over-process them, which will turn them to nut butter! Mix the bread and nut crumbs with the cardamom, salt and orange zest and set aside. Put the butter into the bowl of an electric mixer with two-thirds of the sugar and beat with the paddle attachment for 3-4 minutes, or until very pale and fluffy. Add the egg yolks, little by little, ensuring that each amount is incorporated thoroughly before you add more. Stir in the nut-breadcrumb mixture. Put the egg whites into the bowl of an electric mixer and whisk until they start to froth. Add the cream of tartar and whisk to soft peaks. Then, with the motor running, scatter on the rest of the sugar and continue whisking to stiff, glossy peaks. 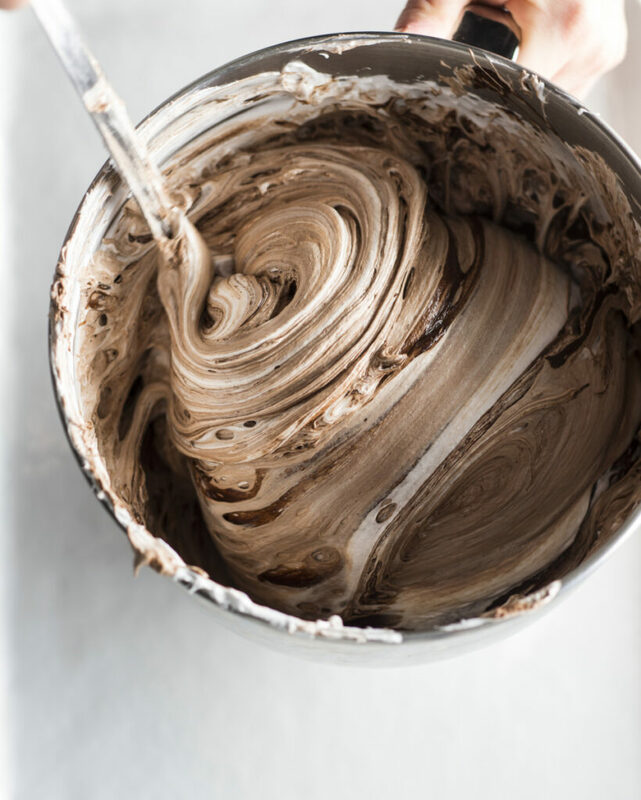 Add a large spoonful of meringue to the cake batter and mix in to slacken, then add the rest of the meringue and fold in gently but evenly with a large metal spoon, taking care not to lose volume. Tip the batter into the prepared cake tin and smooth the surface evenly. Bake for 50 minutes, or until the cake is a deep golden brown and a skewer comes out clean. It will rise in the oven and then fall, so don’t panic. Cool the cake in the tin for 5 minutes, then turn it out onto a wire rack and leave to cool completely. Dust with cocoa just before serving, on its own or with whipped cream.